Ideo Mobi Rangnam is a new launch condominium by Ananda Development. 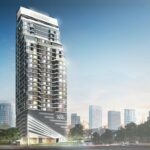 Located at Soi Rangoon, Phayathai Road, Bangkok, the project is about 630 metres from BTS Victory Monument and 135 metres to upcoming new Orange Line MRT Station. The 31-storey freehold development will comprise studio, 1 bedroom and 2 bedroom units and expect to be completed in September 2019. Ideao Mobi Rangnam is designed by Tandem Architects 2001, Design Worldwide Partnership and Redland. The Ideo Mobi Rangnam is located 600 metres from the BTS Victory Monument Station and is also accessible from the Rang Nam MRT Station. The Rang Nam Station is on the orange line that is coming up in 2024. The Ideo Mobi Rangnam has many interesting facilities and cutting edge featuressuch as a 360 dramatic pool, solar cells for every residential unit, a smart solar dash board and solar fresh air system. The following graphic shows the various facilities and features of the development. The Ideo Mobi Rangnam is located 630 metres from the BTS Victory Monument Station and is also accessible from the Rang Nam MRT Station. The Rang Nam Station is on the orange line that is coming up in 2024. Nearby, there are future development projects such as the Makkasan Complex, a mega project from the government including a grand park museum and hall of exhibition. There is also the future mass transit Orange Line that will link the suburbs to the CBD. There is also the Suntiphap Park and Makkasan Park nearby to provide owners and investors with healthy living and eco-friendly activites. In terms of healthcare, there are well known hospitals nearby such as the Rajavithi Hospital, Queen Sirikit National Institute of Child Health, Phramongutklao Hospital, Mahidol University Faculty of Dentistry and linked to Culalongkorn University by 3 train stations. In terms of lifestyle choice, Ideo Mobi Rangnam is 260m to King Power Complex, 1 k to Center One, 1.4 km to Central World and 3 stations to Siam Paragon. The following map shows key locations near Ideo Mobi Rangnam, namely the Rang Nan MRT station (right side of the map), King Power (left side), Santiphap Park (above Ideo Mobi), BTS Victory Monument and the Victory Monument (both upper far left). On the ground floor, Ideo Mobi Rangnam fronts Din Daeng Rd, Rangnam rd West/Santiphap Garden, Rangnam rd South and Makkasan Garden. Parking is found on the 2nd to 8th floor while residential units are on the 9th to 29th floor. The first floor is for the lobby, parking and greenery. From the 30th floor upwards are the facilities such as sky garden, fitness area, 360 dramatic pool etc. The units also have a smart solar fresh air system with accompanying solar panels and a dashboard. The following pictures show the ground floor, floors 9 to 20 (residences), floor 30 (360dramatic pool and jacuzzi), 31 (fitness corner and lounge & library) and roof top garden. In the bathroom, there are Toto toilet and seats, auto washlets, semi recessed basic, undercounter basin, shower sprays and single lever lavatory faucet. There is also a rain shower heads, hand shower head, clothes rack, sliding rail, ventilation fan, tissue holder, shower screen and door and stainless floor drain. Ideo Mobi Rangnam consists of studio (27.9 to 30.2 sqm), 1 bedroom (30.1 to 40.5 sqm) and 2 bedroom (48.75 to 65.95 sqm) units. Discounts available from S$4,000 to S$16,000 depending on chosen unit.